Thinking of making a romantic Christmas proposal this year? Have the perfect bespoke engagement ring but need the perfect Christmas proposal moment? What an enchanting time of year to propose! Get romantically whisked away in the sparkle and magic of the Christmas season. Snuggle up by the fire, wear soft, fluffy jumpers, admire the twinkling fairy lights and start the rest of your life with the love of your life. If you’re still not sure how to reveal that beautiful, bespoke engagement ring, don’t worry, I’m here to help 😉 I’ve put together some fun ideas to help inspire your Christmas proposal. 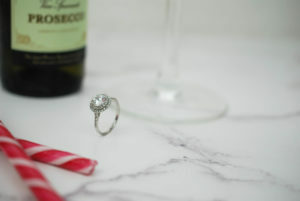 And, if you’re still looking for the perfect bespoke engagement ring to propose with, then send me your ideas. Or, you can check out the other bespoke engagement rings I’ve made here. Be sure to check my Christmas deadline dates before you order. You’re probably familiar with the tradition of putting a silver coin in the Christmas pudding. It’s said to bring luck to the person who finds it. But have you heard about the one where a bespoke engagement ring was put in the pudding and brought a lifetime of happiness to the finder? No? 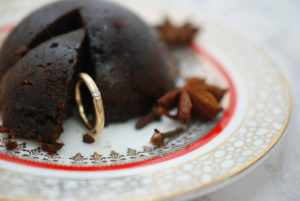 The Christmas proposal pudding? No?! We’ll now’s your chance to make it your perfect Christmas proposal! Mixing tradition with innovation, a proposal in a pudding fits perfectly with our attitude of making the pudding the star of the show at the dinner table. Just don’t cook the ring! Wrap the ring box in an airtight container first. Place it in a cutaway part of the cooked and cooled cake. I recommend cutting a chunk out of the bottom of the cake and putting it in there so that it can’t be seen from the side or top of the cake. Put it inside the cake just before you serve it and make sure you serve your partner the correct slice. Put the ring inside a cracker. Challenge your partner to a cracker-off and make sure you lose (hold the cracker lightly at the end. To win, you just need to hold the entire end of the cracker and a bit of the centre. I mean, only joking, I don’t really know this. Ahem). To get a cracker big enough to fit the engagement ring and box you can make your own. I’ll be posting a blog soon with instructions to make your own Christmas cracker. Christmas morning treasure hunt? Why not. Hide the contents of the stocking or smaller presents around your home and invite your partner to hunt for them. Make sure the ring is hidden in the hardest place to find and is presented as the star prize. 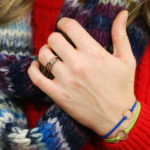 If you’re feeling brave (and the ring is wrapped up well) take the treasure hunt outside. Assuming we’re lucky enough to get a white Christmas this year you could hide it in the crisp snow outside, definitely the last place they’d look! Let’s celebrate. It’s Christmas after all! Pour a glass of Prosecco or champagne and tie the ring around the neck of the glass with some beautiful ribbon. Alternatively, delicately place it into a whole strawberry and pop the strawberry on the edge of the glass. You will need to wash the ring afterwards but if it’s only for a few moments it shouldn’t do any harm to the ring. How long will it take your partner to notice it’s there? Cheers! The most romantic story I’ve heard is of a man who gave his girlfriend a beautiful wooden pendant to wear. She wore the necklace every day for a year and then at the end of the year he invited her to break it. She hesitated at first to smash her beloved jewellery. But, when she did, she discovered the bespoke engagement ring he’d placed there. She’d been wearing it around her neck every day for a year. You could make your own version of secret jewellery with an engagement ring hidden inside. Invest in your gift this year ready for the big reveal next Christmas day. I would LOVE to make a commission like this. Get in touch if you want me to make the most romantic present of the century. There you have it, just five of my ideas for fun and romantic Christmas proposals. I’m really curious to hear from any of you who are planning a Christmas proposal this year. How will you do it? What are your ideas? And if you’re still looking for a ring, don’t forget to check out my ready-made rings and bespoke engagement rings here. Want to stay up to date with current shows and events? Subscribe to my newsletter here!